When you hear the name Big Church Foundation, what comes to mind is a Ministry...a Church. This is not a Church. It is a philantropic organisation which reaches out to people of all sects and religion who have needs requiring support. especially orphaned children and nursing mothers making it possible for local communities to access the funding, tools, training and support they need to become more effective and make our world a better place. and supporting infrastructural development. Working at providing Quality Education for underprivileged children, providing Financial Assistance to needy families, sponsoring Local Organizations with funding, tools and training and so much more. The Big Church Foundation organised an event which brought smiles on the faces of the less privileged. 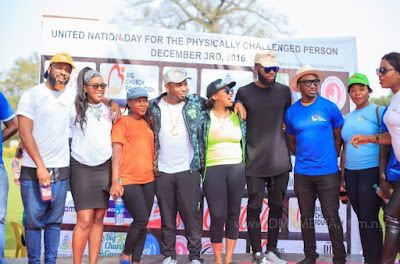 The WALK OF LOVE held on the 3rd of December 2016 bringing together dignitaries and celebrities from all around Nigeria to share, interact and give to the handicapped in Society. This Act of kindness and love had Eagles Square as the meeting point from where the walk began to the Millennium park where it all climaxed with Food, gifts, medical support, exhibition and so much more for the handicapped in Society. The CEO, Big Church Foundation, Dr Olakunle Churchill decide to roll out the drums for this exciting event at this time of the year with the major objectives which includes assessing the current status of the Convention on the Rights of persons with disabilities and mobilize support from his friends and notable people in the society‎ to lay the foundation for a future of greater inclusion and equity for persons with disabilities. It seeks to increase awareness on how to implement measures to improve lives of disabled people all over the world.The global blueprint for action summons us to “leave no one behind”. The event was proudly supported by Tonto Dikeh Foundation. ‎The event was also to commemorate the United Nations World Disability Day. Present at the event to share love and gifts to the Handicapped were celebrities like: the chairman CEO Big Church Foundation and his wife,Sensational Musician Praiz, The Aneke Twins, Halima Abubakar, Helen Paul, Rugged Man, Emma Nyra, Lyrical Bez, KaySwitch,Victor Ancrum, Vibrant Media Personality Rachel Bakam aka the Piper, Charles Awurum, Jaywon, Mamuzee twins,uti, swanky jerry and so many others. Also present was the female Coach who led the Nigerian team to victory at the Para-Olympics held recently. The very next day, a Celebrity football match was held for Charity and on Thursday 8th December 2016 is significant as free eye care will be provided for 400 people. The WALK FOR LOVE and this entire initiative by THE BIG CHURCH FOUNDATION was indeed a true illustration of how Society should be and the spirit of the season. The Haves give to the Have-nots and the Celebrity reaching out to the Isolated in Society.Thumbs up to big hearted Dr Olakunle Churchill and his humble wife who both served the handicaps by themselves. Thumbs up to the Big Church Foundation and members of the Big Church Groups. Long live love and kindness in our Society.